The short summary above is accurate, but thought I’d write a summary of my season and culminating race that concludes my involvement in All Schools Triathlon. My first race at the Australian All School Championships was at Penrith in 2013 and I finished 7th. I was absolutely stoked with this result. I had just started triathlon a few months earlier coming from a very active background in other sports but with little swimming. I was very “fit”, just not experienced and as technically proficient as some of my competitors across swimming, cycling and running. I was determined to improve and worked hard with support of my family and coaches Rod Cook and Ben Higginbottom. Fast forward to 2017/2018 season and what do you know, I’m right in the middle of the Year 12 and it is freaking hard. I purposely decided to put triathlon on the backburner this year solely to get the most out of my free time, spending it with family, friends and in the odd free period at school studying, which requires me to attend the local beach with the boys to work on our “wellbeing” (Well that’s what we convince ourselves). Some of the fun involved ruthless banter, out of tune sing-alongs (so I’m told! ), too much talking, nail painting (Team NSW tradition now) . . . and racing! I love racing. So with this in mind, Higgo and I met and agreed that this year was just about getting the job done. School and family first, triathlon whenever there is spare time – but with what time we have… don’t waste it! I achieved goal #1 by racing in the Elite Men’s field in Glenelg, Adelaide in February. It was an eye opening experience – giving me the opportunity to establish a solid framework in which to build myself. An 11th place against top international athletes has given me confidence for the future. I achieved goal #2 by winning the Oceania Championships in New Plymouth. What an adventure that was, jetting across the ditch, arriving over a day later than initially planned due to delays, and then opening my bike bag to discover one of the airlines had smashed my Felt Bike supplied by CFN – it was unrideable. Luckily Mitchell Cycles in NP were quick to lend me a brand new bike to drop some watt bombs on! Plenty laughed at me in transition, it certainly didn’t have race wheels and the flashy gear, but a bike doesn’t pedal itself and my legs where the same ones I left Australia with. The final race of the season was the National All Schools Triathlon, fittingly held at Penrith where I started my All Schools career back in 2013. I wanted to finish with a win and make it 5 in a row! But as always, I never underestimate my fellow competitors and know that racing is not just about being the fastest, you have to get to the start line ready to race and be prepared for any number of eventualities. Decision time!! … Should I wait for the massive bunch behind me? HELL NO! There was a whole lot of “shut up legs” and “Allez, Allez, Allez” going through my mind trying to minimise any damage and deficits caused by the boys up front. Riding solo for 15 km is quite a long time in a draft legal sprint distance triathlon.Time to consider faults and failings or time to keep the end goal firmly in mind and in sight. I took one glance behind me with about 3km to go on the bike and saw they were nearly upon me so rather than smash my legs I dropped the wattage and jumped into the big bunch that had formed behind me. I’ve been riding once or twice a week for the last two years when it’s not holiday time, but funnily enough, Higgo asked me to ride a 20km time trial 2 weeks ago, and we were fortunate the local cycling club had one that weekend. At the time I thought it was a silly idea, I’m preparing for draft legal racing, but as he said – you have to be prepared for anything. I certainly appreciated the experience. This wasn’t my plan, not that we have race plans, but I certainly didn’t want to come off the bike having no idea how far ahead the other athletes were. I found out after the race the gap was beyond a minute. Apparently the chat over the microphone was of disbelief that I could get the win. I’m not sure if anyone tried to tell me the gap, I couldn’t hear them if they did so it makes no difference to how hard I go. I just said to myself that this is my last chance, and set out of transition determined to give absolutely everything I had – ALL the way to the finish regardless of the result. The run course was set out as about 2km out to the turnaround and then 3km back to the finish line. I was a man on a mission and worked hard to catch the boys out front. I couldn’t even see them for the first few minutes, my eyes being pretty poor as well and they were obviously a long way in front. I was hurting but hunting and just kept going hard until I managed to catch Lachlan Jones at the turnaround and take the lead. Lachie is a superb athlete and I was chuffed to see him going strong at the pointy end. After surging for 500m to build a gap…. And realising I had, I switched off and soaked up the last 2.5km of my final school triathlon. I threw high-fives all-around and blew a few kisses 😉cause I mean… you know. It was one of the best feelings over the last couple of hundred metres and i wanted to take it all in. Dropping a 15.47 5km in my Mizuno Wave Sonics in this way gives me a sense of confidence leading into the World Junior Triathlon Champs in September. 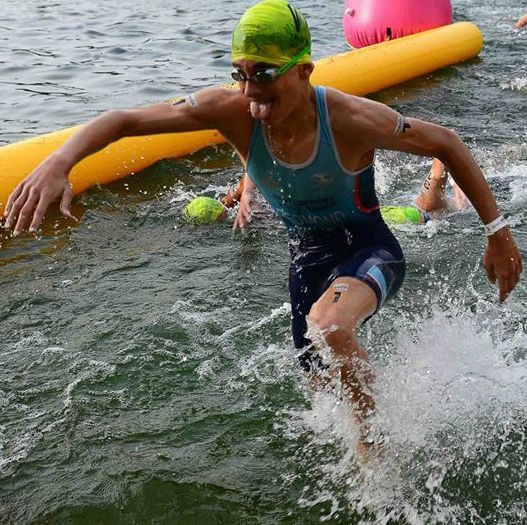 It will be a tough build juggling family and school priorities with the fun, that is triathlon. It certainly hasn’t stopped me before and it wont stop me now. Racing All Schools Triathlon for six years has been an incredible privilege and I’ve met many of my best friends through this sport and on the camps away. I love going to races and catching up with you all. I’ve been well supported by my schools, TriNSW and TA, as well as School Sport Australia who have put on wonderful races in great locations for the athletes. And the local guys and gals I’ve trained with, swimmers, cyclist, runners, triathletes… especially the TriNova crew. A few others I need to thank are Jamie Turner, the TA High Performance support alongside the AIS. Paul Sharman and Anthony Webb who help me with my swim and gym. Paul Franks who helps with management. And of course, Rod Cook and Ben Higginbottom who have been with me since I started. My biggest thanks go to my inner circle. Mum, Dad, my grandparents, family and David, you guys have been awesome over the last 6 years – 5 in a row – it’s all for you! Sport defined by the generally accurate Oxford Dictionary is ‘an activity involving physical exertion and skill in which an individual or team competes against another or others for entertainment’. Sport consists of competition. Competition in itself is something that needs to be prepared for. I believe we do not see a greater example of people who work hard, prepare and lay everything on the line than that of our Olympic athletes. Preparation for these athletes is much more than going for 30 minutes worth of recommended exercise per day. Preparation consists of hours, weeks, months and years of brutally hard work. Blood, sweat and tears are not even spoken of within the athlete circle… because they are simply inevitable. 10000 hours of work to reach your peak? Stuff that…. That’s some guesstimate that wouldn’t even scratch the elite level of competition. The amount of preparation required to make, compete and stay at the elite level is not something that can be put into hours, miles, years etc. To be present at the Olympics requires a great deal of work…. Full time. Training is only one aspect of the work. The best athletes are constantly working on their game, visualizing everything to the simplest movements, planning what to eat next, preparing equipment, writing in the training journal, going to bed early, always beaming a positive outlook and high standard in public, speaking to coaches, managers and sponsors… even writing blogs 🙂 oh… Did I mention training? On top of this, some athletes work part-time, full-time, attend school and uni, maintain relationships and run errands. The point I am trying to get at, is simply how hard athletes work to be at the top of their game, especially those who perform at a high level; Olympics, Commonwealth games, World Championships etc. Now let’s roll over to another pressure point that is constantly on an athlete’s back and that is the general public. How many times over the last 16 days have you woken up to a negative Facebook post, newspaper article or status update stating that an Australian athlete has underperformed or they crumbled? Who put the initial “performance standards” in place for us to compare these athletes to – the public, the armchair critics and the people who haven’t run more than the distance to the bus stop down the street. Yes, maybe the nation did underperform… but they didn’t work hard. People say the athletes worked 4 years for these games, no they didn’t! They worked many more. They worked something like 24/7. Sleeping, eating, training to schedule and convincing themselves they have what it takes to beat the standard of which is within their OWN head. I certainly do agree that there needs to be some change… but please, before you say that a mistake was made by Bill or Bob or Sarah or Sharon, just take a minute to reflect on the 24/7effort that these inspirational people put into their sport. Think of the tears, the blood and sweat, the dedication and the sacrifice. Sport is what the athletes do, the armchair critics are those who are entertained… It isn’t the other way around. Athletes are an extraordinarily driven bunch of people. Whether they be elite, amateur, age-grouper or junior they all have one thing in common and that is the will to succeed and the pure desire to constantly better themselves. This drive and desire is very important to use and is needed for better performances, results and PB’s. The only problem with this is that the constant slog and result orientated mindset can become addictive, almost like a drug. I’ll flip this to a triathlete-perspective. About a year ago I woke up one morning with a scratch-like feeling in the depths of my throat and lungs, routinely, I headed to training all the while a little voice was in the back of my head saying “Lorcan, don’t do this!! This is obviously some little dirty bug you have picked up…. you will definitely get worse if you push through”. Me being me, I chose to do the dumb thing and ended up being bedridden for a whole week with a respiratory tract infection. This could have been avoided, to some extent, if I had been smart and made the “Instinct call”. This is a small example as to why we all need to drop the DRIVE and DESIRE mindset every now and then. One thing in particular that my coaches have constantly told us short course and long course athletes is that “Great results and performances come from a constant and consistent slog over a number of YEARS, despite what people may say, there are NO shortcuts, only hard(and easy)work.” This is very important to remember and does not come from being in the DRIVE and DESIRE mindset all the time. To be consistent it is important to mix up the RELAXED and DRIVEN part of yourself every now and then. Not every training session will be amazing, races are the time to shine, they are the days to put everything on the line. Race-day is the time to give 110% both mentally and physically. Despite what others may believe.. from MY point of view: Not every day, session or workout needs a goal or focus. Enjoyment is the key to longevity and that may come from simply being outside on your bike and rolling around the streets, cutting laps around an athletics track or swimming fluent laps in the pool. You don’t need to download and obsess over your times, splits, speed, heart rate and whatever other fumbly jumbly numbers there are after every session, at least not all the time. I encourage you to get outside by yourself or with some mates… whichever YOU prefer. Swim, Ride or Run as fast or slow as you like. Forget technique, forget cadence, forget heart rate, forget power… just do it for the sole feeling of pure enjoyment. The time will come when 110% is required. I have been lounging around all day today (As you do on a Sunday). I have had quite a bit of time to think…. so I started a blog. So over the coming weeks, months and years I hope to give you an insight into the life of me, Lorcan Redmond…. the journey in pursuing my dreams, conquering teen pimples and fighting sharks. Stay tuned and LIVE LOUD! I know that’s pretty cheesy, but I need some sort of sign-off!!! We all love coach Rod Cook… including his growth. Hammering away to my Oceania Youth Triathlon Championships win! !